Moonrise Kingdom, directed by Wes Anderson, reviewed. A gorgeously shot, ingeniously crafted, occasionally irritating Wes Anderson bonbon. Also in Slate: See our interview with Wes Anderson, in which he explains his obsession with childhood fantasies and his love of pop music, and head over to Brow Beat to play Wes Anderson Bingo. And Moonrise Kingdom (Focus Features) is fun: a gorgeously shot, ingeniously crafted, über-Andersonian bonbon that, even in its most irritatingly whimsical moments, remains an effective deliverer of cinematic pleasure. (Unless you really hate Wes Anderson, in which case I bet it would be one of his funnest movies to mock.) A love story about two 12-year-olds who run away together, this film returns to the territory where Anderson, for better or for worse, seems most creatively at home: the threshold between late childhood and early adulthood, with all its ineffable longings and peculiar manias. The preteen hero and heroine, Sam Shakusky (Jared Gilman) and Suzy Bishop (Kara Hayward), fall in love inexplicably, deeply, and at first sight, in the summer of 1964: She’s dressed as a raven for her part in a church pageant about Noah’s Ark, he’s attending the show with his Khaki Scout troop. The following summer on the exquisite fictional island of New Penzance (where he goes to camp and she lives year-round), Sam escapes from his tent and meets up with Suzy for a meticulously planned romantic idyll—they pitch a hand-decorated tent on the beach, catch fish and read each other stories, even experiment with some stiffly chaste French kissing. All the while, Suzy’s parents (Frances McDormand and Bill Murray), Sam’s camp counselor (Ed Norton) and the island’s lone policeman (Bruce Willis) scour the island for the missing children, with the remaining Khaki Scouts assisting in the search. Ingeniously constructed and paced, Moonrise Kingdom leaps between this chase story and a series of short, lyrical flashbacks, including an impressively efficient epistolary montage. These give us glimpses into Sam’s and Suzy’s unhappy home lives, or in Sam’s case, lack thereof. He’s an orphan, bouncing between foster care and prisonlike group homes; she’s a hot-tempered head case who finds a book on top of the refrigerator titled Coping With the Very Troubled Child. Other plots weave in and out of Sam and Suzy’s romance: Suzy’s mother has been having an affair with the cop, and her bitter, depressed husband is on to them. Sam’s foster parents have decided to put him on the street after two years, and an officious woman from Social Services (Tilda Swinton) is looking to haul him off to a sinister “juvenile refuge.” These are some pretty dark things to have happen between your characters—betrayal, abandonment, the threat of imprisonment—but Anderson seems always to hold the chaos of negative emotion at arm’s length, inviting pathos even as he deflects real investment. He’s a cool director, not just in terms of aesthetic tastes (Can you imagine Wes Anderson’s music collection? And how organized it must be? ), but of emotional temperature as well. Whether that emotional reserve comes off as stylish or stunted varies, as I mentioned above, from scene to scene and even within scenes. I never, for example, believed to the core in Sam and Suzy’s romance, the passionate rightness of which is meant to power this whole story. Part of this may be that neither of these two perfectly likable young actors managed to consistently hit the right tone for the clipped, obliquely funny dialogue by Anderson and Roman Coppola. To be fair, it’s a challenging tone to hit: “Deadpan” can be a micro-inflection away from “expressionless.” Most of the adults here manage it, though: Ed Norton is both hilarious and touching as the dedicated but incompetent troop leader, who conducts inspections with a martinet’s high standards and dictates a nightly “Scoutmaster’s Log” into a two-reel recorder. Willis and McDormand bring way more acting ammunition than is needed to their wispily underwritten romance. And Anderson stalwarts Murray and Jason Schwartzman own their roles as, respectively, a cuckold dad and a power-mad camp counselor, but they remain on the periphery, like wandering jesters. Even as it charmed me scene for scene, I could never quite locate the source and direction of this film’s dramatic energy. 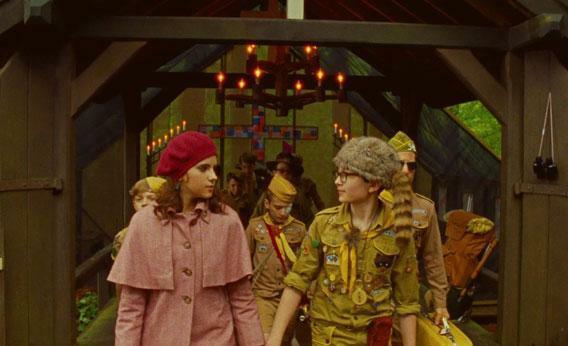 But maybe it’s OK to find Moonrise Kingdom both dramatically inert and aesthetically entrancing, to recommend it with a Wes Anderson asterisk (which would probably be a bright yellow asterisk, lovingly embroidered on brown corduroy). I hope so, because if loving this Texan-turned-Parisian’s cunning compositions and inspired use of music and staggeringly detailed production design is wrong, I don’t want to be right. Yes, he’s something of an obsessive hobbyist, a creator of self-contained, inaccessible ships in bottles (a creation metaphor that Anderson literalized in The Life Aquatic With Steve Zissou). And yes, I think it would be a good thing for him as an artist to break through the glass at some point and start sailing those ships on open waters. But the miniaturist details in this particular bottle—the flyleaf-style hand-drawn maps of New Penzance Island; the landscape shots as precise and delicate as watercolor paintings; the scratchily recorded children’s music of Benjamin Britten; the delightful presence of Bob Balaban as a narrator who’s half Hal Holbrook in Our Town, half Delphic oracle—are marvelous enough that I’m willing to wait around and see what he builds next.